You have your content, your page looks amazing, now it’s time to get people talking. More importantly get a conversation going. 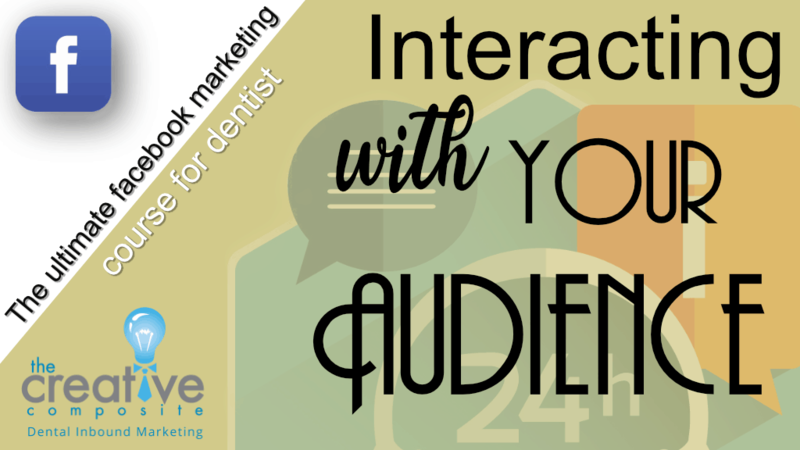 Interact with your audience. There are many different ways to engage with your followers on Facebook. By actively engaging your audience, you will be adding personality to your practice and help build trust and also grow your client base. When it comes to interacting with your customers on Facebook, you can start with simple messenger automation. This means that when somebody visits your page for the first time they are met with a small pop up message box which will allow them to type in any questions and queries. You can create a quick auto repose such as “Thank you for your message! We will get back to you shortly!” This then gives you time to process requests and answer them accordingly. In your autoresponse message, you could also include other places and ways to find answers to any questions, for example sending a link to your website which holds more information. As well as maybe a telephone number with opening hours if some customers are after a more immediate response from you. Of course, you can not have a small chat bot arrive on the screen every time someone simply sees one of your posts. One of the ways to increase your audience interaction is to basically make sure that when you post it gets seen. This means using Facebook analytics and experimenting with what times and days are the best to post. In terms of timings, the best times to post on average tend to be 7am-9am then at 12pm-2pm and finally in the evening around 7 pm. As we will explain later on, in more detail, yo u can schedule these posts so you do not need to be glued to a screen waiting for the right time to post or setting yourself alarms. Furthermore, when it comes to people seeing your posts don’t forget to remind them. Post in the run-up to a video being uploaded. This is not to say spam your followers feed with reminders as this will turn them away but instead post a small and simple reminder. This is also where using other social media channels can come in useful because this way you can reach a wide range of audiences at the same time. Let them know you are about to post and after you have, tell them about it again. Of course you do not need to do this with every post, instead, you can do this for your bigger more important posts. Such as big announcements, deals, offers or something exciting you know your audience will enjoy. I know I keep saying followers, audience, customers and so on but it is important to remember that while I am referring to your clients as a group they are in fact individuals, who all post there own content. Don’t be afraid to get in the thick of it. Share your customers content, you could have a favourite customer post of the week or month. This helps to of course build rapport and more importantly, it will encourage to share your content as well. The use of a favourite customer post also brings into play the idea of competition. People always like to win so don’t be afraid to engage your followers in a little friendly competition. For example, this first person to share your post receives 10% off their next treatment. The prize does not necessarily have to relate back to your business, for example, the prize could be vouchers or a gift basket un-related to yourself. Of course, it is always a good idea to keep your prizes and offers that pertain to yourself so everyone stays focused on your practice. Moreover, when it comes to engagement on posts it is important to remember to prioritise comments and replies. As I mentioned earlier using an auto-response will help you maintain customer trust and interaction, but when it comes to comments on a post try to reply to as much as possible. Another point when it comes to comments is using pictures in the comments. Photos on average get about 53% more likes and that means more engagement and replies within your own posts. Your aim is to appear and feel like a Facebook friend instead of a soulless corporation. Another way to increase interaction with your followers is by joining different facebook groups. One of the most common groups you can find on Facebook are based on local areas, many local postcodes have their own group in order to share stuff happening in the local area. As a local business, this is something you can take advantage of, not only will it give you insight into the local community but also allow you to reach them directly. Furthermore, you can always join groups that are not simply based on your location. You know what your customers are interested in, you know their hobbies and employment. You should know that you could also join Facebook groups relating to this knowledge as well. This will give you an edge over your competition as the more you know about your existing and potential clients the better and more refined you can make your content. In turn improving your engagement and in turn, increasing your conversion. As well as joining pre-existing groups it is important to note that you can always start a group yourself. You can have a group for all your current patients and then add in new patients when they come. This adds an element of exclusivity and for people considering your practice it gives them a little incentive because if they join your practice they can become apart of a private group. In order to really make sure the group feel exclusive you could share some bonus content and maybe provide them with offers not available to the general public. Setting up a group is easy, simply go to your ‘Create’ tab at the top of your Facebook page. Then choose a group. Once you have you will then be able to name your group and add in who you want. You can choose to make this group public (anyone can find the group and join) closed (anyone can find the group but you choose who may join) and secret (only members can find the group and only you can choose who can join). To add exclusivity and make sure that your group does not become overloaded, creating a closed group is recommended. After you have added in who you want you are ready to add your profile picture and cover photo similar to setting up your Facebook page. You can also post content as you would normally on your business and personal pages. What is a call to action? A call to action is something that makes a visitor of your page want to click through to more content or to a landing page for your website. Call to actions are normally a button and include phrases like “Click to learn more” and “Book a free consultation today”. More importantly, this is where your blog posts can help. Through your Facebook followers clicking on your blogs posts, they will be taken through to your website, in turn, your blog will include multiple call to actions within in that will encourage further engagement and when done correctly will lead to a customer conversion. As you may have noticed, all different forms of social media these days include a story function. This means you can share small snippets of content, including GIFS, short videos and images to your audiences. These stories will delete themselves after 24 hours and then the next day you will have a blank canvas. The fact that the stories disappear after 24 hours give a sense of urgency like you have to watch it now before it is gone. This is a similar effect to live video but with more of a temporary effect as your audience can still share and comment on a live video after it has finished and has been uploaded to your page as a normal video. Overall the main things that are important to remember are that the more interaction the better. Do not be afraid to dive right in, as I said your following is not a lump mass of numbers but are actually unique and complete individuals. Use auto messenger and facebook analytics as a quick and easy way to follow up with your audience and know when is the best time to post so that your content is seen. As with everything on social media have fun and so your personality, get involved in groups and even start your own. You want to be known as a friendly and approachable practice, not a heartless business.